This fabulous corner unit has just come on the market. It looks and feels like a 5-star hotel and pictures don't do it justice. It has been featured in the Interior Design Magazine "DayBeds" and comes with a mix of east and western design and materials, exclusive thai art and custom-made furniture. The room layout has been totally redesigned for that perfect combination of function and luxurious living. The unit features 2 bedrooms and 2 bedrooms over 96sqm with 2 balconies. The new modern kitchen includes an oven, dishwasher and washing machine. Hardwood floors in the bedrooms makes for an even more exclusive feeling. The building has 24-hours security, indoor parking, exercise room, conference room, children's playroom. There are also an 18m long swimmingpool, separate children's pool and a separate "sundeck" with Jacuzzi. 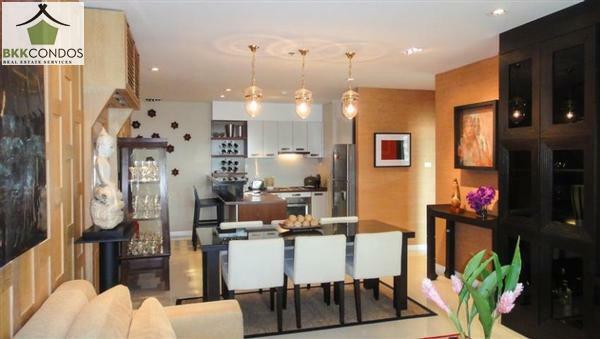 Situated on one of the trendiest sois in Bangkok, just seconds from exclusive restaurants, nightclubs, international hospital and schools, this unit would make a great residence for someone with taste for the finer things in life. Please contact us now for an exclusive viewing.